With Mongo ́s TOTAL you create your very own taste experience and then indulge to your heart’s delight! With our fixed price offer you can turn each course into a unique experience. Try our specialities as you please! As an entree we offer you one of our delicious soups and curry bread with a homemade dip. For your side dish you can order our fine thai rice as often as you wish. Select the sauce of your choice. Put together the favoured dish of your choice at the food market. Our chefs prepare your dish swiftly and carefully and right before your very own eyes. The finished dish together with a serving of rice is then brought to your table. We trust you will enjoy your meal! 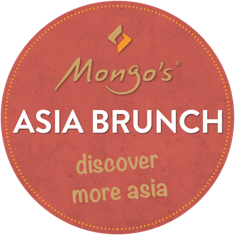 Enjoy Mongo ́s SELECT and pay only what you have chosen! Go to our food market as often as you like. You will only be charged for what is in your bowl. For this purpose everything you yourself have created is weighed prior to cooking, excluding the marinades. When you have had your fill, we add up all of the gram readings; but no matter how much you have eaten, you will be charged no more than the price of Mongo ́s Total. Select the marinade of your choice at your table. Our chefs prepare what you have selected swiftly and carefully and right before your very own eyes. The finished dish is then brought to your table. Apart from the items on our food market, we also offer a buffet for starters, a soup station, a waffle station and a buffet for dessert! Our buffet for starters comprises, amongst other things, different, constantly changing salads (e.g. oc-topus salad, Goi Muc, prawn salad, hoisin or Asianmushroom salad) and changing warm starters such asbreaded butterfly prawns. At our soup station we offer a changing range of Asian soups, like the Mongo ́s Tom Kha Gai or the le-mongrass cream soup. This offer is accompanied by different items that allow you to customize your soup and will be prepared by one of our cooks for you. Our desserts start off with a waffle station, where we prepare changing waffle recipes for you - varying bet-ween coconut, sesame and strained lime leaves. This is followed by a selection of chilled desserts, that are equally updated from brunch to brunch: chocolate mousse, mango mascarpone and many other little treats take their turns. In addition, fruit salad will al-ways be on offer. This is accompanied by an ice creambuffet and as well as a selection of warm desserts such as our death by chocolate. We offer our brunch on every Sunday and on many holidays as well. ‍You can get all dates from our service staff ! All prices you can find in the menu on the restaurant sites! 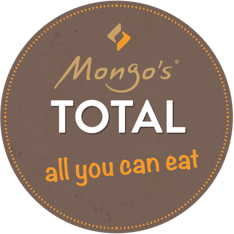 With Mongo's TOTAL you create your own taste experience, as often and as much as you like! Go to our food market as often as you like. You will only be charged for what is in your bowl! In addition to the ingredients on our food market, we also offer a buffet for starters, a soup station, a waffle station and a buffet for dessert! Try our fantastic homemade soup bowl. Depending on the season, we offer our changing soups. Watch out for addictiveness! Crispy Wan-Tan-Coconut-Shell wraps creamy cool vanilla ice cream. We guarantee for nothing! Absolutely handmade! Authentic Japanese dessert! Fruity mango, passion fruit and lychee ice creamwrapped in a sweet and thin rice dough. Hot´n Cold! Vanilla ice cream shocks lukewarm chocolate cake! Awesome! Let ́s celebrate! The dessert-party of the year! Death by chocolate, raspberry lemongrass crème brûlée,fried vanilla ice cream, homemade raspberry sorbet and our seasonal dessert!